A Charmed Wife: Danger Danger! Got your attention with that title, didn't I? Good. Most of the time when I write a post, I hope it presents a little bit of new information that doesn't make you think, "duh, I already knew that." However, with today's post, I actually hope you already know this. Recently, I mentioned this little tidbit of household safety to a friend (who shall remain nameless), and was a little rattled to learn she had never heard this before. So, just in case some of you are similarly ignorant, I thought I had better spread the word here. 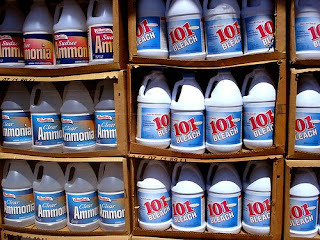 Here goes: You should never ever EVER mix bleach and ammonia. Not under your sink, not in a skating rink, not in a box or with a fox. When bleach and ammonia are mixed together, they produce Chlorine gas (which is a chemical weapon, and will kill you). That means that not only should you store your Clorox-based products and your Ammonia products (Windex, Fantastic) well-sealed in separate cabinets, but you shouldn't bleach your shower tiles and then Windex your shower glass without first giving the whole thing a really good rinse. I mean, unless you are attempting to off yourself in an indirect, painful manner. But then, why are you cleaning the shower? Great post! And I am ashamed to admit that I only recently learned this cleaning hazard! My mom did this when I was a kid. Boy, were those fumes powerful! Took the finish right off the floor which was her goal anyway.